than Auber stopped her with a gesture. "Enough," he said. "Come here, my child." The little girl, who was pale and thin, but whose eyes gleamed with intelligence, approached him with an air of assurance. "Your name is Sarah?" he said. "Yes, sir." was the reply. "Yes, sir, by birth; but I have been baptized." "She has been baptized," said Auber, turning to his colleagues. "It would have been a pity if such a pretty child had not. She said her fable of the 'Two Pigeons' very well. She must be admitted." Thus Sarah Bernhardt, for it was she, entered the Conservatoire. She was a Jewess of French and Dutch parentage, and was born at Paris in 1844. Her father, after having her baptized, had placed her in a convent; but she had already secretly determined to become an actress. In her course of study at the Conservatoire she so distinguished herself that she received a prize which entitled her to a debut at the Theatre Francais. She selected the part of Iphigenie, in which she appeared on August 11, 1862; and at least one newspaper drew special attention to her performance, describing her as "pretty and elegant," and particularly praising her perfect enunciation. She afterward played other parts at the Theatre Francais, but soon transferred herself from that house to the Gymnase, though not until she had made herself notorious by having, as was alleged, slapped the face of a sister-actress in a fit of temper. The director of the Gymnase did not take too serious a view of his new actress, who turned up late at rehearsals, and sometimes did not turn up at all. Nor did her acting make any great impression at the Gymnase, where, it is true, she was only permitted to appear on Sundays. At this theatre she lost no time in exhibiting that independence and caprice to which, as much as to her talent, she owes her celebrity. The day after the first representation of a piece by Labiche, "Un Mari qui Lance sa Femme," in which she had undertaken an important part, she stealthily quitted Paris, addressing to the author a letter in which she begged him to forgive her. After a tour in Spain, Sarah returned to Paris, and appeared at the Odeon. Here she created a certain number of characters, in such plays as "Les Arrets," "Le Drame de la Rue de la Paix," and "Le Batard," but chiefly distinguished herself in "Ruy Blas," and in a translation of "King Lear." Already she had riveted the attention of the public and the press, who saw that a brilliant future lay before her. At the end of 1872 she appeared at the Comedie Francaise, and with such distinction that she was retained, first as a pensionnaire, at a salary of six thousand francs, and afterward as a societaire. Her successes were rapid and dazzling, and whether she appeared in modern comedy, in classic tragedy, or as the creator of characters in entirely new plays, the theatre was always crowded. Her melodious voice and pure enunciation, her singularly varied accents, her pathos, her ardent bursts of passion, were such that her audience, as they hung upon her lips, forgot the caprices and eccentricities by which she was already characterized in private life. It seemed, however, that Sarah's ambition was to gain personal notoriety even more than theatrical fame; and by her performances of one kind or another outside the theatre make herself the talk of society. She affected to paint, to chisel, and to write; sent pictures to the Salon, published eccentric books, and exhibited busts. She would receive her friends palette in hand, and in the dress of a male artist. She had a luxurious coffin made for her, covered with velvet, in which she loved to recline; and she more than once went up in a balloon. Her caprice, whether in private or public, was altogether unrestrained. In 1880 Emile Augier's admirable comedy, "L'Aventuriere," was revived at the Comedie Francaise, and the author confided the part of Clorinde to Sarah Bernhardt. After the first representation, however, she was so enraged by an uncomplimentary newspaper criticism that she sent in her resignation to M. Emile Perrin, director of the theatre, quitted Paris, and went to England, where she gave a series of representations, and, appearing there for the first time, caused a veritable sensation in London society. Meanwhile, M. Perrin instituted against her, in the name of the Comedie Francaise, a lawsuit for breach of contract, with damages laid at three hundred thousand francs. It was at this juncture that Sarah accepted the offers of an enterprising manager for a tour in America, where she achieved no less phenomenal successes than in Europe. A sensational account of this American tour was afterward published by one of her associates, Mlle. Marie Colombier, under the title of "Sarah Bernhardt en Amerique." This was followed by a second volume from the same pen, entitled "Sarah Barnum." The latter book, as its title suggests, was not intended as a compliment; and Sarah Bernhardt brought an action against the writer, by which she was compelled to expunge from her scandalous volume all that was offensive. The rest of Sarah's career is too recent to be traced in detail. Nor can the life of an actress of our own time be dealt with so freely as that of a Sophie Arnould or an Adrienne Lecouvreur. 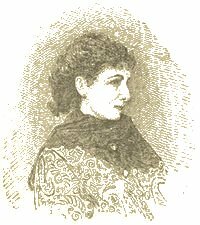 From America Sarah returned to Paris, where she revived all her old successes, and where, in 1888, at the Odeon, she produced a one-act comedy from her own pen, entitled "L'Aveu," which met with a somewhat frigid reception. She has appeared in several of Shakespeare's plays with great success, but her most ambitious and perhaps most admirable productions of late years have been her Cleopatra, first produced in Paris in 1890, and her Joan of Arc. Among her numerous eccentricities, Mlle. Bernhardt once got married; London, by reason of the facilities it affords for this species of recreation, being chosen as the scene of the espousals. The hero of the matrimonial comedy, which was soon followed by a separation, to which, after many adventures on the part of both husband and wife, a reconciliation succeeded, was M. Damala, a Greek gentleman, possessed of considerable histrionic talent, who died in 1880.